Invisalign in Half the Time! SuperFast Invisalign is the invisible way to straighten your teeth. Using advanced 3-D computer imaging technology to project tooth movement, Invisalign creates a series of clear, custom-made aligners that gradually move your teeth into the desired position. With SuperFast Invisalign, you can eat, brush and floss normally, and no one can tell that you are straightening your teeth! At Barotz Dental in downtown Denver, Colorado, you’ll see your own virtual treatment plan right in our office, so you can view your amazing new smile before finishing treatment! SuperFast Invisalign treatment consists of a series of clear plastic aligners, created precisely to gently and gradually move your teeth into place. Virtually Invisible: No one can tell you are straightening your teeth. Completely Removable: Eat, drink, brush and floss, or take them out for special occasions such as weddings, prom, or senior pictures. Faster Treatment Time: No fixed metal brackets or wires to adjust means you’ll spend less time visiting the doctor. You will receive a new set of aligners every other week during Invisalign treatment. More Comfortable: There are no wires, metal or brackets to cause mouth abrasions. Know your Results: At Barotz Dental you can view your virtual treatment plan right in here in our downtown Denver office, so you can see how your corrected smile will look when treatment is complete, even before you start! Why is it called SuperFast Invisalign? The Propel System is a micro-invasive procedure performed by orthodontists to greatly reduce the time in which teeth are moved. Through a groundbreaking scientifically proven, patented process called Micro-Osteoperforation™, the alveolar bone is stimulated to induce an inflammatory response that greatly accelerates tooth movement in the treated area. When used during active treatment, the length of time required to move teeth has been shown to be reduced by up to 50%. Thanks to PROPEL technology, Dr. Barotz is able to shift your teeth faster and complete your Invisalign treatment in half the time of ordinary Invisalign!! Not only is SuperFast Invisalign versatile, helping to correct a broad range of dental and orthodontic issues, it’s highly effective as well. A confident smile isn’t the only benefit of correcting your dental issues with custom-made Invisalign aligners – your health can be positively impacted as well. SuperFast Invisalign can correct overly crowded teeth, widely spaced teeth, crossbites, overbites and underbites. Dr. Barotz will work to design a custom treatment plan with your specific dental or orthodontic issue(s) in mind. Your treatment program will consist of a full set of aligners, made for you, and only you. Overly crowded teeth: This occurs when there isn’t enough room within your jaw for all of your teeth to fit normally. When left untreated, overly crowded teeth can cause dental decay, an increase in chances of gum disease, and can even prevent the normal function of teeth. Widely spaced teeth: This occurs with excessive continued growth of the jaw bone. When teeth are missing, this issue can also be caused by the other teeth shifting due to extra space. Spacing issues can cause some periodontal diseases, and result in bone loss. Crossbite: This happens if the upper and lower jaws are both misaligned. One or more of the upper teeth will bite on the inside of the lower teeth. This can happen on both the front or the sides of the mouth. Patients with this situation can experience wear of the teeth, gum disease, and bone loss. Overbite: This familiar situation happens when the upper teeth bite over the lower teeth. It’s typically caused by genetics, bad oral habits, or over-development of the bone that supports the teeth. In addition to cosmetic issues, this situation can lead to gum problems or irritation, and/or wear on the lower teeth and can cause painful jaw and joint problems. Underbite: An underbite happens when the lower teeth protrude over the front teeth. It’s usually caused by undergrowth of the upper jaw, overgrowth of the lower jaw, or both. It can also be caused by missing upper teeth. This issue can prevent the normal function of front teeth or molars which can lead to tooth wear. It can also cause painful jaw and joint problems. Step #1: Schedule an appointment for a complimentary consultation. During this visit, Dr. Barotz will ask you about your smile and what you hope to achieve through Superfast Invisalign treatment. If you are a candidate for SuperFast Invisalign, a treatment plan will be mapped out with your goals in mind. Then, impressions and pictures of your teeth will be taken for digitization purposes. Step #2: The impressions of your teeth will be digitized in order to work with a computerized 3-D image of your teeth. Your tooth movements will be planned throughout your entire treatment timeline. You’ll be able to see a virtual representation of your teeth before, during, and after the Invisalign process so you can see what your smile should look like when done with treatment. Step #3: Customized aligners are created with advanced technology for you to wear at each stage of your treatment. While the number of aligners varies for each individual situation, a full set of treatment typically includes 20-30 aligners per arch. Are you interested in SuperFast Invisalign from Barotz Dental? Visit our website or give our office a call to set up your complimentary consultation today! At Barotz Dental, we take pride in our ability to provide Total Dental Solutions in a timely, comfortable and personalized manner. However, dental emergencies do happen, and when they do, we are always prepared to deliver for anyone in need. Whether you are a local or visiting from out of town, we are here for you! We understand that visiting the dentist can be an intimidating and unsettling experience. As a response to this common sentiment, we bend over backwards to put patients at ease during every visit. We offer warm neck pillows, blankets, fresh baked cookies, iPads with Netflix and more to help patients relax in the chair. We also offer a variety of sedation options. From the outset in 1980, our practice has been designed as dental spa that can comfortably accommodate all patients, even those with the worst cases of dental phobia. Whether you have a real fear of the dentist or simply don’t enjoy having your mouth worked on, we take the measures to ensure your trip to Barotz Dental is comfortable, personalized and free of fear and anxiety. Most importantly, everyone at Barotz Dental, from the front office to the assistants to Dr. Barotz himself, truly cares about the people that we touch. We are not a typical dental practice. One of the ways in which we differ from an ordinary dentist is that we meticulously manage our schedule so that we can perform additional treatment when needed or accommodate patients experiencing a dental emergency. Whether you need to be seen ASAP or sometime in the next few days, give our office a call and we will not put you off until the “next opening” on the calendar. We can always find time to address your concerns within days or even hours in some cases. Whether you are new to the practice or a current patient, we are here for you! Of course, with our convenient downtown Denver location, we are never too far from victims of dental emergencies. If you visit our office by car, you can take advantage of our complimentary valet parking at the Holiday Inn Express. If you live or work in the downtown area, we are just a short walk or Mall Ride away at the south end of the 16th St. Mall. Or if you live in some of the surrounding communities, the light rail is always an efficient and effective option for getting to our office. When finding a dentist, it’s common practice to look for a reputable doctor that is conveniently located close to home or work, or both. When it comes to cleanings, preventative care, and maintenance, this logic makes a lot of sense. However, as a mature adult, dental needs can often be much more complex. Many offices around the country are not equipped to treat these complex dental problems, and consequently they are relegated to referring their patients with advanced needs from one specialist to another. When you think about it, patients with a variety of dental problems could spend weeks driving around town for consultations simply to get the advice they need on their path to long-term oral health. For example, a general dentist might refer a patient to a periodontist for gum disease, a different specialist for a dental implant, and finally a third specialist for root canal therapy. This patient could be left waiting for weeks just to get their foot in the door for a consultation at some of these specialists! Not to mention the inconvenience of driving all over town and constant interference with your daily routine, and this is all before you even proceed with treatment! When you think about it that way, traveling to downtown Denver, where Barotz Dental offers Total Dental Solutions all under one roof, can make a lot of sense. In fact, we have been the Mile High City’s one-stop-shop for quick, comfortable and comprehensive dental care for over 35 years now. For those in other parts of Colorado, New Mexico, Nebraska, Wyoming and Kansas, it can be quite difficult to have a variety of dental issues treated in one office, all under one roof. At Barotz Dental, we are equipped to treat virtually all dental problems, so your care can be completed quicker since it is all done by one doctor in one location. Often times, when more extensive treatment is performed, we will even put our out-of-town patients up in a nearby downtown Denver hotel. We also meticulously manage our schedule so that we can accommodate write-ins and emergencies on a daily basis. By design, we are never too busy for a patient in need, and immediate appointments are always available, whether you are coming from nearby or far away. 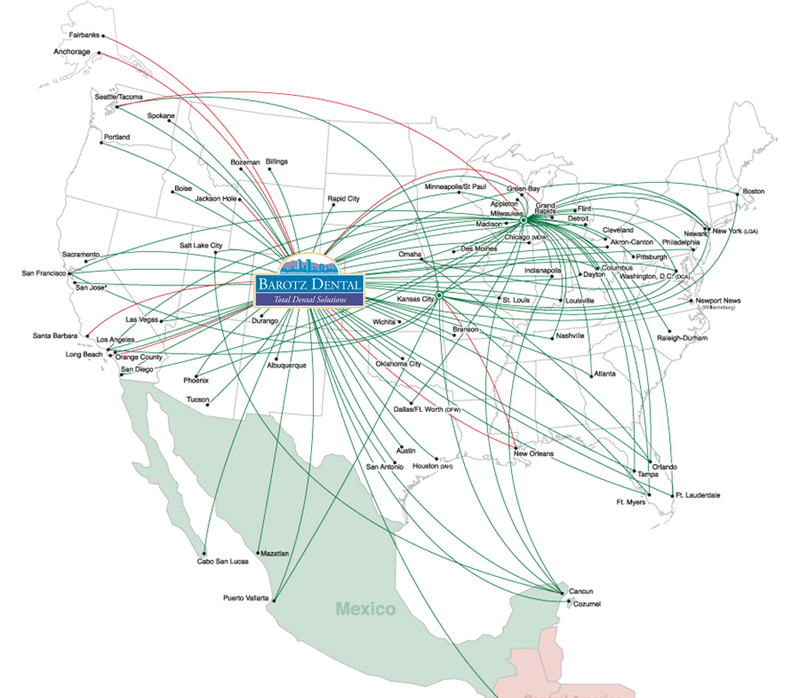 We have patients that fly in from the west coast, some that drive in from Northern Colorado, Wyoming, Kansas, and even a patient who lives in Qatar that travels to Denver for his dentistry. Whether you want to save your teeth, beautify them, or replace missing ones with implants, we have the best and quickest solution/s for you here in downtown Denver. Some of the many services we provide that most general dentists typically refer out include:As a mature adult, dental problems can become more complex. If you find yourself being referred all over town, calling specialists and visiting with doctor after doctor, then give us a call today. We offer all patients a complimentary consultation and will do everything we can to accommodate when scheduling your appointment. Find out if you can save time, money and frustration by having your dentistry done here in Denver. You can always reach us at (303)595-4994 or via email at BarotzDental@BarotzDental.com! Last Friday was Gumday at Barotz Dental. After 36 years of serving greater Denver, the Mile High City is fairly familiar with Dr. Charles Barotz’ ability to provide quality, comprehensive dentistry all under one roof. We strive to set the standard of excellence in dentistry and, in an effort to preserve time out of our busy patients’ day, we do this in the quickest, most efficient manner possible. When we think dentistry, most of us tend to think of teeth, but rarely do we think or talk about gums. The fact is, gums are incredibly vital to the state of your oral health and beauty. Sometimes they can take a turn for the worse when oral hygiene becomes a lower priority (as can so often happen with many of us). It’s amazing what can be accomplished in dentistry today. Are you concerned about your gums? Would you like to rejuvenate, reposition or repair your gums in any way? Give Barotz Dental a call today and learn how our Total Dental Solutions can help you achieve your oral health goals. To enhance the lives of the people that we touch by providing the most up-to-date high quality dental care in a comfortable and personalized matter. Treating gum recession with surgical grafting is a procedure that involves cutting out a piece of the palate and stitching it in the area of recession once that area has been surgically prepared. This particular technique for treating gum recession has evolved significantly, but despite these advancements, it is still a procedure that would leave my patients in significant post-operative pain for weeks. Recently, I personally ended up with a severe case of gum recession due to some trauma to my gums. I had heard of the Pinhole Surgical Technique but assumed it would not be sufficient for treating my severe problem. 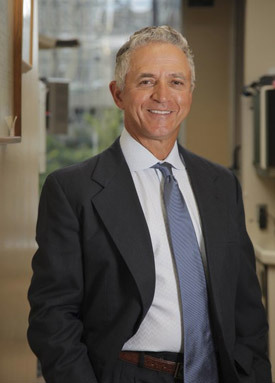 Dr. Barotz now offers the Pinhole Surgical Technique for treating Gum Recession to any of his downtown Denver, Colorado patients in need. So I went ahead and proceeded with the traditional cut and stitch gum grafting. In the end, my surgeon performed the operation beautifully, but despite her superb skill and technique, the treatment still left me in agony for over two weeks due to the nasty nature of the procedure. That said, my interest in Pinhole Gum Rejuvenation peaked as I started to wonder if I could’ve been spared this awful experience. After reviewing the literature and attending a webinar, it became evident that I truly could have spared myself this pain and misery if only I had elected the Pinhole Surgical Technique to treat my gum recession. At that point, I immediately made reservations for the next certification seminar so that I could present my patients with this miraculous treatment option. After days of intense training at the Pinhole Surgical Academy in California, I am now certified to perform this amazing procedure. I am elated to be able to offer this new, revolutionary, quick and easy procedure to the people of Denver and surrounding communities. There are many cases of gum recession that, in the past, I would not have recommended getting corrected because of the pain and suffering involved. The amazing thing about the Pinhole Technique is that patients tend to feel just fine the very next day. At this point in time, thanks to the Pinhole Surgical Technique, I am less reticent to recommend proceeding with gum recession treatment because it can be handled with so much less discomfort and yet still provide superior results. 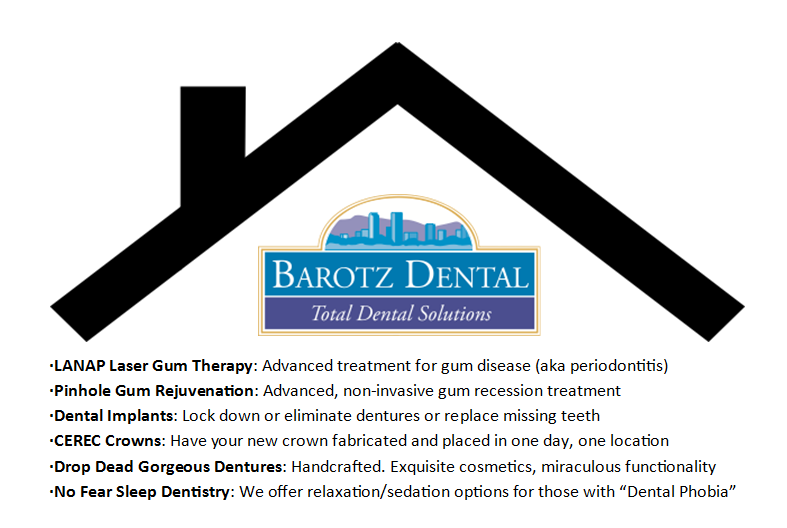 At Barotz Dental in downtown Denver, Colorado, we are concerned with more than just your overall and oral health. We are concerned about you as a person, your feelings, concerns and emotions. While the gum grafting surgery has served its purpose in the past, it did not allow us to treat complex gum recession problems in the comfortable manner that patients have come to expect at Barotz Dental. This is why I am so excited about the Pinhole Technique, as it has enhanced our ability to provide Total Dental Solutions in the least invasive, most modern way possible.